Walkins are welcome, but entry not guaranteed when full. BURROW CAFÉ is a hidden haven located adjacent to the Beehouse, 76 steps down from the gate with a separate entrance that goes underground. Below is a lush space with large panel windows showcasing the surrounding forest. The Burrow's Café is a fully operable kitchen with a regular breakfast and lunch menu and set hours. The cafe hosts bi-monthly dinners (by reservation) for occasions and hallmark events. (3) For cancellations kindly notify us at our number 0917-622-9795. (4) We will hold your reservation for 15 minutes from your time. Once this has lapsed the table will be given to others unless advised. (5) The subdivision of Beverly Hills charges P20 entry per car at the gate. If you are interested in hosting a private event here, the Burrow is a versatile space and can accommodate gatherings of up to 50 to 60 people. We can help connect you with our chef and partners who can provide all of the trimmings from dinnerware to flower arrangements. Email us at burrowcafeph@gmail.com for inquiries. 1. 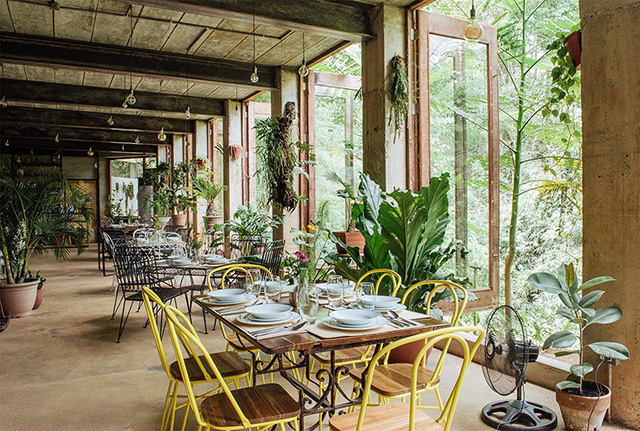 The Burrow is a hidden haven located within the grounds of Antipolo Beehouse, accessible 76 steps down by the river, nestled underneath a garden. Alternative ramp access is available. 2. Elderly need to be able to navigate stairs to visit. 3. We discourage high heels unless you are an expert. 4. Parking will be driveway parking. You may Waze Burrow Cafe for directions, we are located within Beverly Hills Subdivision Antipolo, at the end of the road. Look out for a wooden BEEHOUSE sign along bamboo fencing to your left. Entry to cafe - stay right along the wall, proceed to take the stairs down just along the gate. There are two ways to reach us: via Ortigas Extension and Marcos Highway. We advise to consider traffic in planning your way here and avoid using Ortigas Extension. Reservations are responded to within 2-3 days. If you make a reservation within a shorter lead time you may not receive a response in time, as we go through reservations in the order they are made. Yes - please advise us immediately for cancellations at 09176229795. It is recommended weekend & weekday reservations are made 7 -14 days prior your preferred date. Reservations are responded to within 2-3 days. If you make a reservation within a shorter lead time you may not receive a response in time, as we go through a backlog of reservations in the order they are made, when we are able. Calls are taken during our operating hours, and as much as possible we answer each call we receive. We would advise to reserve another day, when you can enjoy the cafe longer. The cafe closes at 4PM, the kitchen takes last orders at 3:30PM, while the bar can take orders till 4PM. If there are guests we extend till 4:30PM. Pets are not allowed cafe proper, they're welcome to stay at the garden above the cafe, where there are outdoor furniture (leashed and with a companion at all times). From Cubao you could take an LRT Santolan Station which would take you to Marcos Hiway. From Marcos hiway, ride an FX/jeep leading to Antipolo. Before it turns left at Ynares City Hall, get on another jeep heading down to Tikling - tell driver you want to go to Beverly Hills subdivision and he'll let you down across the village. Outside the village is Village Corner, get a tricycle from there to the BEEHOUSE usually P30. From Santolan, there are UV Express that go from Robinson's Galleria Terminals to Antipolo. From Tikling there are jeepneys going to ‘Simbahan’ (or Antipolo Church) – tell driver you would like to get down at Beverly Hills Subdivision. he'll let you down across the village. Outside the village is Village Corner, get a tricycle from there to the BEEHOUSE usually P30. From Robinson's Galleria there is a P2P to Robinson's Antipolo. Then take a tricycle from there to Beverly Hills Subdivision. Some friends have informed us the P2P may sometimes drop off right outside Beverly Hills Subdivision. Coming to the café Grabtaxis arrive no problem. Coming from the café however, this can take up to 30 minutes (from experience).